A few weeks after its new iPhone 6 (Plus) was released, Apple showed off new iPads (Air 2 and Mini 3) at an event held in San Francisco. Still remember how tedious it was when deciding between the iPhone 6 (Plus) and iPhone 5S days ago due to notable price difference and significant hardware improvements between the two. It would not be a no-brainer to make an informed decision about which will be the better buy. Based on the aspects that users care most about tablets, we make a comprehensive comparison of iPad Air 2 vs Mini 3 to help users figure out which device will be more suitable. In addition to iPad Air 2 and iPad Mini 3, there are also many more tablets on the market which you can choose from. To help you decide the perfect Apple as well as other perfect tablets, we list a quick and easy guide. Before you go shopping for a tablet, consider your priorities. 1. Display: The display size as well as resolutions is one of the most important factors to consider when deciding which tablet is the best for you. Consider the display size you feel comfortable to handle with. 2. Processor: Is the processor runs in the tablet fast enough to handle your tasks? Do you have any particular requirements on the speed? 3. Battery: Does it last long enough for you to watch videos, play games, browse, read, write, message, etc? 4. Camera: Can the camera of the tablet deliver vivid pictures? Will you rely on the camera a lot? 5. Price: What is your budget about an Apple tablet? Can you just buy the one your want or are you on a tight budget? Released by Apple on the same day, the two pads share some features in common while keeping highlights out of each other's league. To make a wise decision between iPad Air 2 and iPad Mini 3, you are strongly advised to take a close look at the two iPads. To save your energy and time collecting, here we list the detailed features, functions and prices of the two iPads. iPad Air 2 comes with a 9.7-inch display with a resolution of 2048 x 1536 pixels. The display features two major notable features that iPad Mini 3 doesn't offer: fully laminated display and antireflective screen coating. It is the first Apple tablet that is equipped with the former technology. This unique display makes the images sharper and more vivid, with richer colors and better contrast. Antireflective screen coating is another new feature, it reduces reflections by an impressive 56%. In other words, this iPad can provide more clear image than iPad Mini 3 in the same environment. iPad Mini 3 boasts a 7.9-inch display with exactly the same resolution of 2048 x 1536 pixels. Even without the two new features of iPad Air 2, the higher pixels per inch of iPad Mini 3 326ppi also makes it a good device for playing videos compared to 264ppi for the iPad Air 2. To decide which Apple tablet to choose, processor is no doubt an important factor to look at. iPad Air 2 is powered by Apple's A8 processor, with a secondary M8 motion coprocessor. 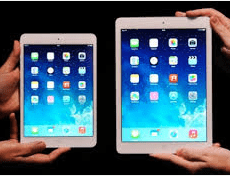 With Apple A8, iPad Air 2 once again pull ahead of Apple mini model, as iPad Mini 3 comes with the same processor as its predecessor - the A7 and M7 motion coprocessor. A8X processor can deliver a better compute and graphic performance than A7 while M8 motion coprocessor can provide more supports and higher efficiency than M7. Together with iOS 8, it will deliver an enhanced experience when you run your apps or play games. Do you use your tablet heavily? Or, to put it another way, do you often use your tablets with many battery intensive activities like watching videos or playing games? If you do, then attentions shall be paid to battery. Both iPad Air 2 and iPad Mini 3 share the same battery life: both devices can support up to 10 hours of surfing the web on WiFi, watching video, or listening to music. This battery life is enough for most of your needs. iPad Mini 3 also loses out on the camera improvements as the main camera in iPad Air 2 has jumped to 8MP from 5MP while iPad Mini 3 remains stuck at a 5MP camera. Clearly the iPad Mini 3 is incapable to compete with Air 2 in delivering vivid and sharp pictures. Besides, the A8X processor also grants it a burst camera mode which iPad Mini 3 does not support. In a word, iPad Air 2 does a much better job in taking photos. If you have enough money, just buy the one you like. However, if you are on a tight budget, the price may be worth your serious consideration. The iPad Air 2 starts at $499 for the 16GB Wi-Fi only version and goes all the way up to $829 for the 128GB version with cellular. iPad Mini 3 is $100 lower than the corresponding iPad Air 2 version. The small price difference drives many people opt for the former as it comes with so many changes outweighing the latter. Below the detailed specs can give you an intuitive understanding of the differences between the two iPads. Now an easy conclusion can be drawn that iPad Air 2 is more superior than iPad Mini 3 in a number of respects. Surprisingly that the smaller tablet model was much more evenly matched with the larger tablet last year and the only difference between the two iPads was the size. Whichever Apple tablet you choose, playing videos will no doubt be an option of entertainment. If you want to experience the new features anti-reflective coating and lamination process on iPad Air 2 advanced screen with some HD videos like DVD movies, you will first of all need a DVD ripper app, driven by the incompatibility issue. Here the professional MacX DVD Ripper Pro can provide any help to put DVD on both new devices by ripping any DVDs, including those copy-protected to the exact new device profile. Similarly, for those who have trouble putting videos to iPad Air 2 or iPad Mini 3, a video converter is also a must-have app. Here MacX Video Converter Pro is highly recommended, for its advanced ability to convert HD MKV, AVCHD, MTS, WMV, AVI, FLV and other videos to iPad Air and mini supported formats or even better, directly to both iPad Air 2 and iPad Mini 3, as well as many other popular devices like Samsung Galaxy Note 4/Edge, Galaxy S5/4/3, HTC One, etc in minutes with high quality.